Not to be confused with Squeek. Squeaks are lavender creatures that only appear in Wario's Woods. 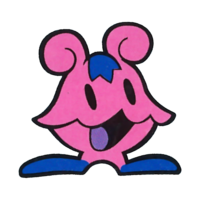 They are the most common enemies in the game along with Spuds and Fuzzes; in fact, Squeaks are the first foes to appear. As is with other common enemies, any bomb chain can defeat Squeak. ↑ Wario's Woods NES instruction booklet, page 6. ↑ Wario no Mori Famicom instruction booklet, fold-out. This page was last edited on November 20, 2018, at 13:52.